I'm taking Intro to Industrial Design this semester at MassArt. ID has always been of interest to me. I'm guessing it spawns from my obsession with sneakers. I remember my friends and I having sneaker drawing competitions during breaks at school, loading up our designs with the latest features, most often including at least one or two Pumps. 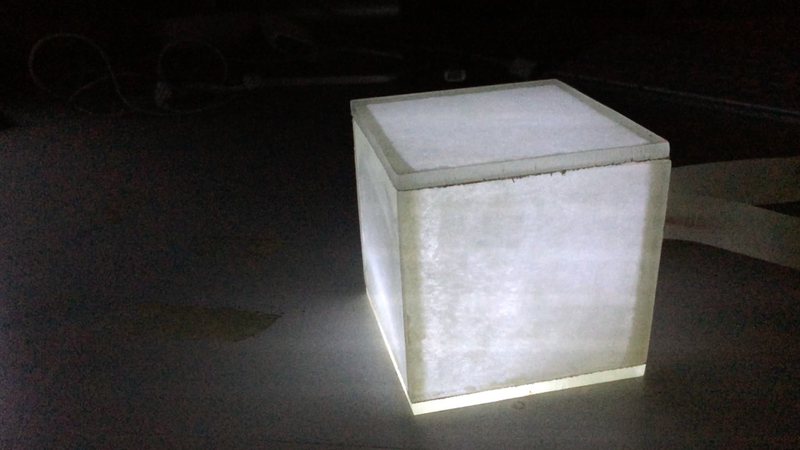 For a homework assignment, we were asked to design and build a 3-inch cube that reflected who we are in some way. I started with a couple of guidelines. I had to use found materials. This reflects an interest of mine to draw inspiration from the materials and spaces at hand. Also, I am constantly poor and often find myself trying to make something beautiful out whatever is cheap and available. I wanted it to combine the physical and the digital. The merging of these worlds is a personal interest of mine, so I wanted to communicate that interest in my cube. Although I want the piece to be somewhat dynamic, I also want it to be simple. I need to try to not over-complicate it. I started by digging through the scrap pile in the industrial design department. There I found some scrap plexi that somebody had laser-cut into. After doing some quick measurements, I realized that there was plenty left for me to work with. Once i had drawn out my 6 identical sides, I went back through my measurements to take out the overlap, to create a snug 3-inch fit. 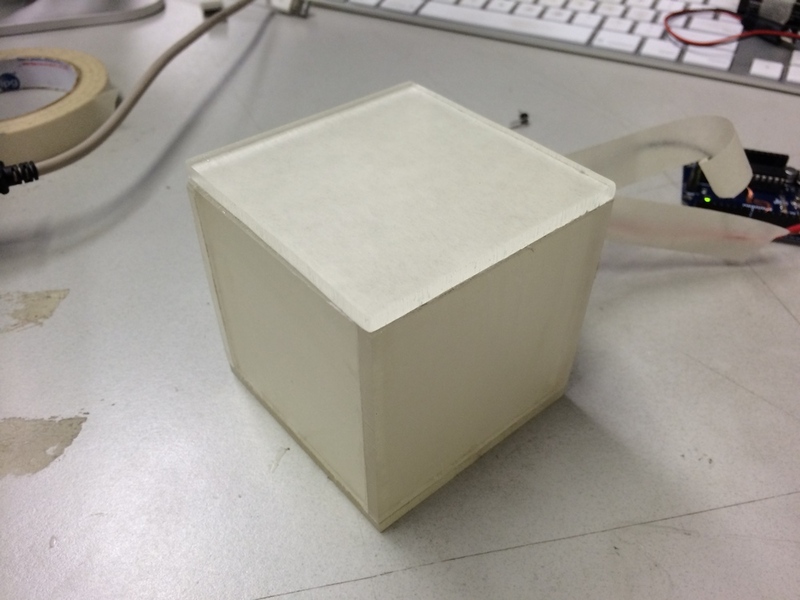 After using some apoxy to adhere the sides of my cube, I set off to solve the dynamic piece of the project. Hopeful to keep things simple, I decided to create a clock that simply kept track of each minute of the day, but without the capacity to remember how many it had tracked. Each minute the LED would start at 0 brightness, and light up more and more until it hit full brightness at 59 seconds. By providing no other information, the box would act as a more meditative clock, reminding the user to exist in the moment, with each minute providing a new opportunity. To solve this problem, I use Processing and an Arduino micro-controller. I was able to take advantage of the built in timer call, seconds(), in Processing, which automatically resets to 0 after reaching 59. I knew based on its design, I could use seconds() to deliver the data I needed to control the LED. By simply adapting the example Arduino Dimmer code, I switched out the entry for the data being written to the serial port to the int s, which corresponds to the seconds in each minute. On the Arduino side of things, I read what was coming out of the serial port (values from 0-59), and mapped them to values that referred to brightness level on the LED (0-256). That value is then set to the designated ledPin. In the end, I think I have a fun simple experiment in bringing a simple physical object to life using the power of data. Hopefully, as my future projects get more complex, I can remember to try to keep things this simple.